If your child seems stressed or moody, or if she struggles with depression or anxiety, you may be missing a simple fix. Sleep. Found out how it influences a child’s mood and how to tell if she’s getting enough. If your child is struggling with stress, anxiety, frequent tantrums or other behavioral difficulties, you might be missing a surprisingly simple solution: He or she may need to get more sleep. Sleep quality plays a key role in a child’s mental and physical health, says child psychologist Dr. Kristen Eastman, PsyD. And if your child often doesn’t get enough, it could be tied to a host of other problems. If you can develop some strategies to help your child get more or better quality sleep, other problems that seem insurmountable may gradually become more manageable. Dr. Eastman answers common questions about how a lack of sleep can exacerbate your child’s difficulties and how to help them develop better sleep habits. Q: How does insufficient sleep affect children? A: Children don’t recover from a sleep deficit as easily as adults do. If they don’t get sufficient sleep, it can contribute to difficulties managing their stress, anxiety and behaviors over time. Kids that don’t get enough rest get fatigued more easily during the day, their fuse is shorter, their attention levels and frustration tolerance go down, and it can strain their ability to learn and retain information. While your child’s lack of sleep may not be the root cause of your child’s problems, it can contribute to an increase in their stress levels, exacerbate anxiety and negatively impact their behavior. Day after day of insufficient sleep in a child may contribute to other issues and make these issues feel beyond control for a family. Improving sleep can break this cycle. Q: How should parents evaluate their child’s sleep? What is their bedtime routine? What time does it begin and where does it occur? What time does your child actually fall asleep? Does this occur independently or is it a struggle characterized by crying or upset? Does your child fall asleep readily or lay awake for some time before falling asleep? 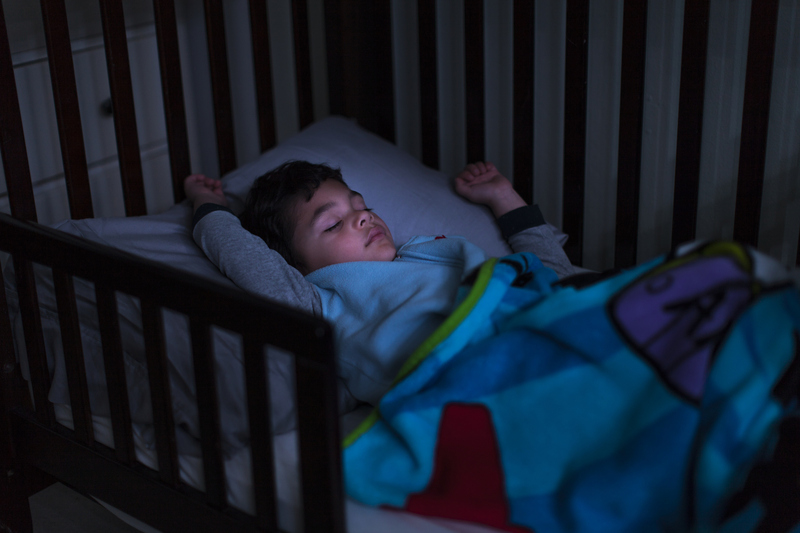 Does your child wake up during the night? If so, can they put themselves back to sleep? What is your child like when she wakes up in the morning? And is this on her own or do you have trouble waking her? Does your child exhibit daytime fatigue? This may be exhibited by crankiness, rubbing her eyes or falling asleep at times she should not. These are important questions because I am looking for patterns that may get in the way of good quality sleep. For example, consistency in bedtime routine is key, but due to busy family schedules is often not adhered to. In addition, “falling” asleep is not the same as “going to bed,” as a child who goes to bed at an adequate time may not be falling asleep (for a variety of reasons) until much later. Quality sleep, therefore, does not begin until later than parents thought. When you also subtract time spent waking up, walking to a parent bedroom or falling back asleep during the night, the total amount of sleep the child is actually getting may be much less than parents thought. I try to help parents understand that rested kids are generally able to “go with the flow” and be more resilient during the day; sleep deprived kids get stuck more often, aren’t as flexible and definitely exhibit shorter fuses (which can manifest in many different ways). Q: How much sleep should children get? Keep in mind that while some children will do well within these average ranges, some may need less but some may actually need more! Q: How can parents help their child get better sleep? A: It is always a good idea to limit sugar and caffeine (including chocolate and other hidden sources) during the day, and avoid them altogether later in the day. If you have younger children, try to maintain a consistent nap time (same time and duration) on most days. If they miss their nap, you may need to move their bedtime earlier to insure they still get the same amount of sleep in a 24-hour period. Also, set a consistent bedtime routine and bedtime. The routine should always be predictable — have bath time, brushing teeth, reading and whatever else they do in the same order every night. This, along with a consistent time to go to bed, cues the body that it is nearing time to sleep. The bedtime routine should end in the child’s bedroom and should be calming. And finally, limit screen time in the hour or two before bed. Bright lights, noises or loud music will stimulate the brain. That stimulation slows our body’s own melatonin production (which helps us fall asleep sleep) and instead makes us feel more awake and alert. I often see children who are chronically sleep deprived and their parents don’t realize it and don’t see it as connected to other difficulties the child is having. Almost all of the time, when parents come back and their child is getting more sleep, they are amazed how problems are already improved. It may not be that the child’s difficulties disappeared completely, but parents often say it feels much more manageable and they are more hopeful about the possibility of continued improvement. As a first step, talk to your pediatrician if you think your child is not getting enough or good quality sleep. Take a closer look and look for what is getting in the way. You can then work together to find ways to help improve the quantity and quality of your child’s sleep, which will be of great benefit.